Urbanisation has reached a global tipping point with more than 50% of the world population now living in cities. For many people, the thought of swelling urban areas brings to mind sprawling megacities like Tokyo and Mexico City, or the packed streets of Dhaka and New Delhi. Few people think of desolate islands as a scene of surging urban migration. But despite their comparatively lower urban population of about 35%, many Pacific Island countries (PICs) are currently experiencing urbanisation rates more than three times the global average. This trend will continue and with it comes an urgent need to address urban issues ranging from infrastructure and disaster risk to health, employment, and crime. Scattered across the Pacific Ocean, the 22 PICs — also known as small island developing states (SIDS) — are home to about eight million people of distinct cultures. The region represents a wide diversity of languages, land use practices, and socio-economic conditions. Perhaps a surprise, the population density of some PIC capital cities is comparable to that of large Asian cities. In the Micronesian atoll nations of the Marshall Islands and Nauru, over 70% of the inhabitants live on the main islands, where their respective capital cities are located. It is projected that by 2020 more than half of the population in the Pacific will live in urban centres due to increasing rural-to-urban migration and the region’s high birth rates. Despite these trends, urban development issues are not a priority for many PICs and only a few have developed formal policies to address urbanisation, such as Samoa’s efforts to establish their National Urban Policy. Although this rural-to-urban migration might seem like a recent phenomenon, migration is not a new strategy for most Pacific Island communities. Inter-island migration has long been a coping mechanism to deal with stressors such as droughts, conflicts, or overcrowding. With the projected impacts of climate change and sea-level rise, migration will continue to be a coping mechanism for Pacific communities, particularly those in low-lying atolls and coastal areas. Rapid urbanisation on the Pacific Islands has brought about a number of benefits similar to other regions of the world: greater access to improved social services and infrastructure, more economic opportunities, enhanced food security, and access to stronger governance and land tenure systems than those found in the rural outer islands. For many of the PICs, most investments in services and infrastructure development target urban areas. This means that there are major disparities between the rural outer islands — where subsistence economy prevails — and urbanised islands, where much of the economic activity is concentrated. But urbanisation has given rise to a myriad of socio-economic and environmental issues in the Pacific Islands, such as increases in informal settlements, civil unrest, environmental degradation, crime rates, and non-communicable diseases. Simultaneously, weak urban management and planning policies have exacerbated these problems. In many PICs, urbanisation has not contributed to a rise in gross domestic product, and a large number of the economies still depend on informal agricultural and tourism sectors. Youth increasingly migrate from the rural outer islands in pursuit of modern lifestyles and the perceived benefits of living in cities. However, the number of jobs in these urban centres has not kept up with the influx of young migrants, resulting in a high rate of youth unemployment, particularly among young women. For example, in South Tarawa, the capital and largest city of Kiribati, there are few private sector employment opportunities and even in the public (government) sector, which accounts for 60% of formal employment, the number of jobs is small. A lack of educational opportunities contributes to this problem, as there is only one technical college with a variety of courses to develop vocational skills. For young men the other choice is to study at the marine training centre so they can work in the seafaring industry. Furthermore, cities across the Pacific struggle to provide services for the disadvantaged (such as low-cost housing) undermining the cultural fabric of looking after one another. This reality stems from how some politicians perceive poverty as an embarrassment. This perception has fuelled the rapid increase in informal settlements in cities like Suva, Fiji, which are often located on marginal land (mangroves and swamps) which is prone to flooding and erosion. Despite these negative developments, urbanisation issues have attracted limited attention from policymakers and donors in the Pacific. Other pertinent issues — such as climate change, overfishing, and biodiversity loss — have been given precedence over the last decade. There has been an increase in funding for programmes related to these issues, which directly threaten the livelihoods of many communities and endanger the bedrock that PIC economies are built upon. These issues have also impacted the rate of urban growth; as many communities across the Pacific lose their homes to sea-level rise and salinisation of limited groundwater resources they are pushed to migrate from rural to urban centres. There is an urgent need to focus on the links between Pacific Island urbanisation and stressors like climate change, which amplify risks to human security but are often overlooked in formal planning and policy processes. While rural-to-urban migration has given rise to a range of urbanisation issues — increasing demand for adequate and safe housing, clean water and sanitation, access to healthy food, and protection from natural hazards, to name a few — they have rarely been incorporated explicitly into national climate adaptation or disaster risk reduction planning efforts that are currently being mainstreamed across the Pacific Islands. The Samoa Pathway Outcome document which sets the roadmap for sustainable development among all SIDS, only mentions urbanisation once in the context of “urban-rural linkages”. This is alarming, given that many underlying processes driving urban vulnerability (such as loss of traditional dietary practices and increased reliance on imported food) also undermine a person’s capacity to adapt to climate change and environmental degradation. Nonetheless, there have been positive regional developments in addressing urbanisation issues in the Pacific, especially in preparation for this week’s United Nations Conference on Housing and Sustainable Urban Development — Habitat III. For example, the fourth Pacific Urban Forum held in early 2015 convened key policymakers who stressed the need for sustainable solutions to urban challenges. They called for increased urban resilience to tackle issues such as climate change, more robust social infrastructure, and enhanced capacity for urban governance. 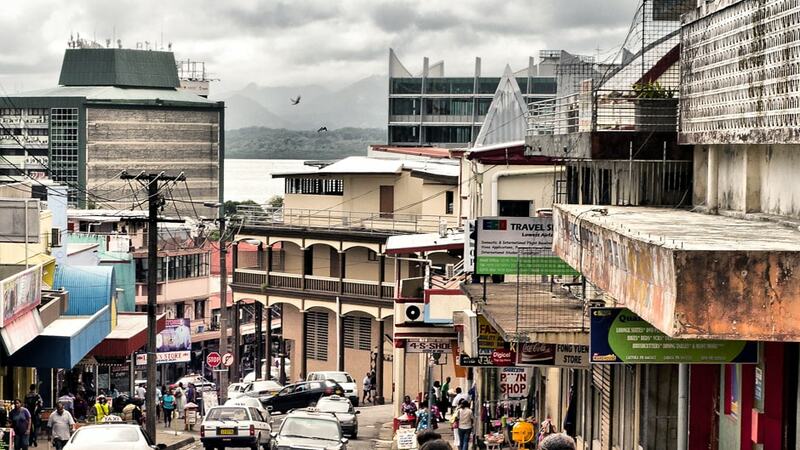 Since the forum, PICs such as the Solomon Islands and Papua New Guinea have begun to develop urban policies. The final draft of the New Urban Agenda gives important focus to PICs in its call for action to address “the unique and emerging urban development challenges facing all countries, in particular developing countries, including … small-island developing states”. This urban focus is timely and essential. The outcomes of Habitat III must propel urbanisation issues into development policy, and seek to pave a path for culturally and contextually sensitive solutions that address the complex challenges of rapid urbanisation in the Pacific Islands. Turning the Tide on Urbanisation Policy in the Pacific Islands by Natasha Kuruppu is licensed under a Creative Commons Attribution-NonCommercial-ShareAlike 4.0 International License. Dr Natasha Kuruppu is a Postdoctoral Fellow with the Planetary Change and Health programme at the United Nations University International Institute for Global Health in Kuala Lumpur. She is a climate change adaptation specialist with a focus on small island developing states.